This here is the Jalou, Sony Ericsson's newest ladyphone. On the surface, it's a boldly-styled, reasonably-specced feature phone. But it she is so much more than that! But before we jump into the marketing spiel, the phone: Despite chunky-looking contours, the Jalou is surprisingly compact, at about 2.7 inches long, closed. Specs are healthy for a flip-phone, with 3G, a 3.2-megapixel camera, video recording, Bluetooth 2.0, A-GPS, a monochrome external display, MicroSD expansion and a full Google mobile software suite, including a YouTube app. Feature phones tend to blur together on the technology front, so styling and form factor are bigger factors than RAM or processor speed—on this front, the Jalou is bold, but possibly divisive. I like it, at least. Now can we talk about the pitch? Because it's pretty great. Sony Ericsson apparently did mounds of research into "art, architecture and furniture trends" while "delving deep into the couture and fashion world," just to make sure that the Jalou FELT THE PULSE—all this according to a designer named Charles. So what did ole' Chuck discover? Lots of things! Like, women hate being fat! And they love mirrors, and makeup! And pseudoscience! The two inch screen's clever design means that at the touch of a button the screen becomes a mirror, offering a discreet way to make sure you look as good as your mobile phone. 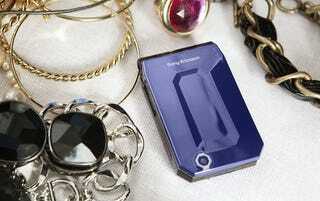 It is also the first Sony Ericsson to feature Walk Mate step counter, to help you stay in shape wherever you go. It also has an exclusive fashion interface which automatically updates with zodiac signs and special events throughout the year.